Praised for his poetic wordplay as well as his catchy yet meaningful hooks Weyland Mckenzie has seen songs from the EP find regular play on 1Xtra, Reprezent and Rinse FM. Northeast highlights Weyland’s versatility as an artist from the hard hitting intro “TDM”, to the Soulful House inspired duet “Hold On it’s Raining” and the lyrical exercise of the final track “Leave” Weyland Shows an ability to slide across genre lines while remaining true to his poetic roots. 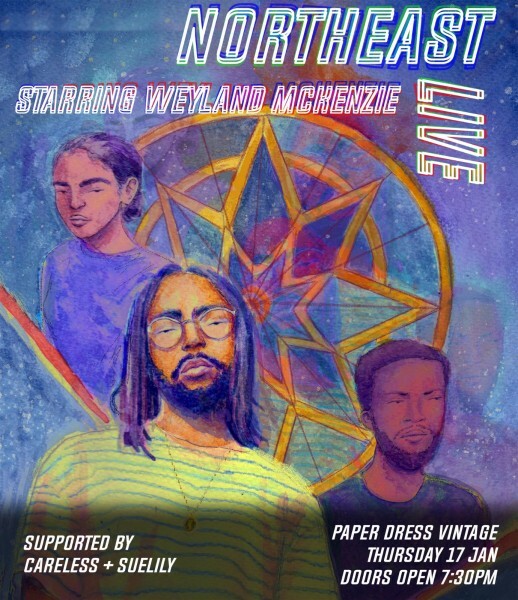 Weyland hopes the bring the EP to life live from Northeast London with this special performance of the EP in full, supported by none other than South London Vocalist SueLily & East London’s very own Careless, the only featured artists who appear on the project.